Today's Reading Post and last week's Chronicle covered Reading Labour Group's launched of an ill-informed petition deliberately scaremongering patients. As a long-standing patient of Priory Avenue Surgery I was surprised and concerned by Labour's petition and their Caversham Councillor's letter (in today's Post). Am I, my family and other patients at risk of being without a GP? Is the Surgery on the "slippery slope" towards privatisation? Will standards slip? NO! Priory Avenue Surgery is simply following the process created by the last Labour government. As the GPs at Priory Avenue no longer wished to continue with their contract, NHS Berkshire put out the GP service to contract - as happens all over the country in these circumstances. Contracts can be managed by a group of GPs, a private company, or sometimes a combination of the two. Importantly it is always a NHS service, therefore governed by strict quality standards. A local extremely well-used example is Broad Street Mall's walk-in Health Centre run by a partnership of local GPs and Virgin Care (formerly called Assura Medical). How else is Labour's petition misleading? It was the last Labour government who introduced the current tendering process for private GP services. Neither my family nor anybody else's family should worry about Labour's silly petition. 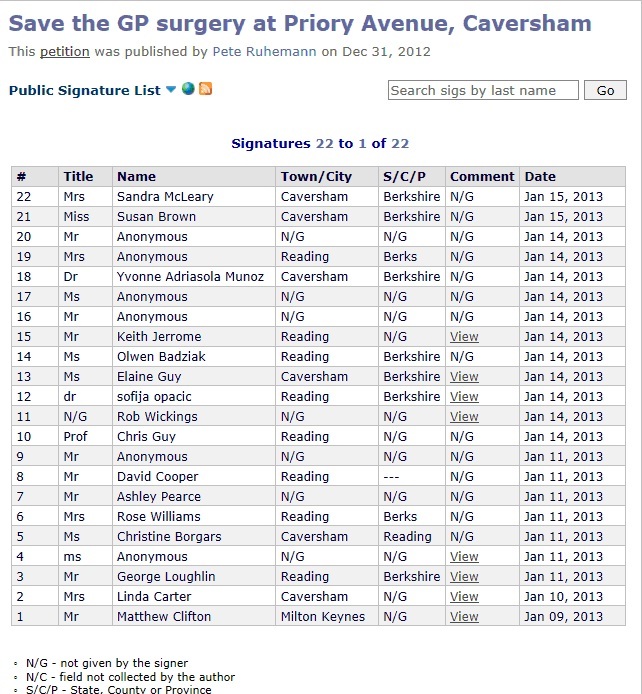 Read Priory Avenue Surgery's website and see the facts for yourselves. The Labour councillors neglected to mention their Party supported patients having the right to choose any provider (including private) at the last general election. They also omitted to say that as a result of changes made by the previous Labour government over a quarter of walk in centres are run privately. 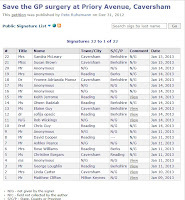 It is interesting to note people who can't possibly be Priory Avenue Surgery patients are amongst the 22 who have signed since the petition was started on 31 December last year. Also many of those 'brave' enough to have their name published are known Labour activists. Strangely though neither Labour councillor mentioned in the publicity appear to have signed!